After a great five days in Ho Chi Minh City (Saigon), we were tempted to stay even longer when we found out that there would be a Santa Con event there the following Saturday. As we were super bummed out about missing out on the Beijing version for the first time in four years, the idea of sticking around to spread drunken Christmas cheer seemed like a good one. That is until we realized we’d have to make a beeline for Cambodia the day after with a brutal hangover. As such, we continued our journey south through Vietnam and booked bus tickets to Can Tho. As the largest city in the area known as the Mekong Delta, Can Tho is a good choice for a short trip to this famous region in southern Vietnam. Not wanting to stay in the actual city center itself, we made a reservation at Hung’s Homestay and arranged for Mr. Hung himself to pick us up at the bus station. His place is more like a rural hotel than an actual home stay, as there are plenty of rooms scattered about around their home. We had a nice, simple little room right next to the river and a place to sit down and chill outside. 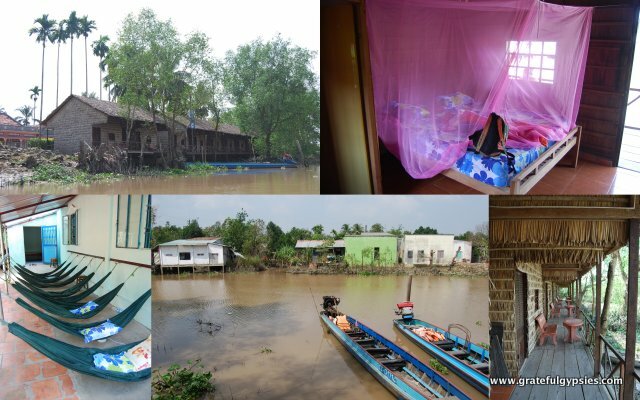 A sampling of photos from Mr. Hung’s Homestay. They made us and the other guests feel like a part of the family by inviting us all to help prepare dinner. Together, we twisted up spring rolls and then ventured into the kitchen to fry them up. Dinner was a big communal feast, with all guests gathered around large tables and enjoying a delicious home-cooked meal (which was included in the price of the room). After dinner, Mr. Hung got out multiple bags of “happy water” (rice wine), and we all had a few too many shots while he told stories and did magic tricks. A giant feast was included in the room price. 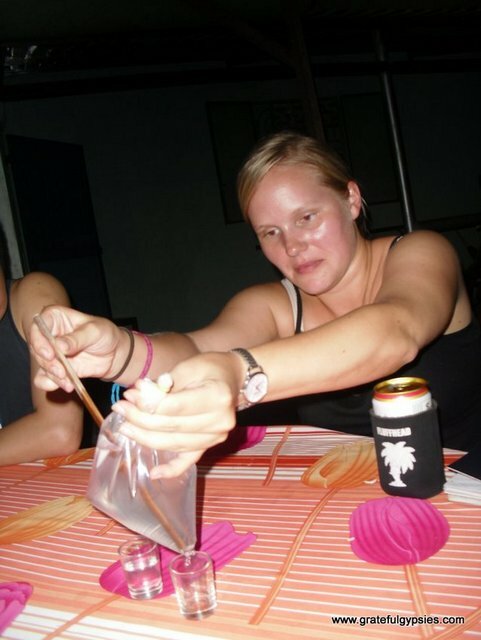 T Girl pouring out some “happy water” shots. It was an early start the next morning as we were heading out with Mr. Hung on a boat trip around the area. The other guests seemed a bit jealous when they realized that we were getting our breakfast on the boat and a private tour with the owner of the guesthouse, while they were all being ushered away in mini-vans. These are the advantages of doing it yourself rather than joining a packaged tour. House boat a little up the river from our guesthouse. 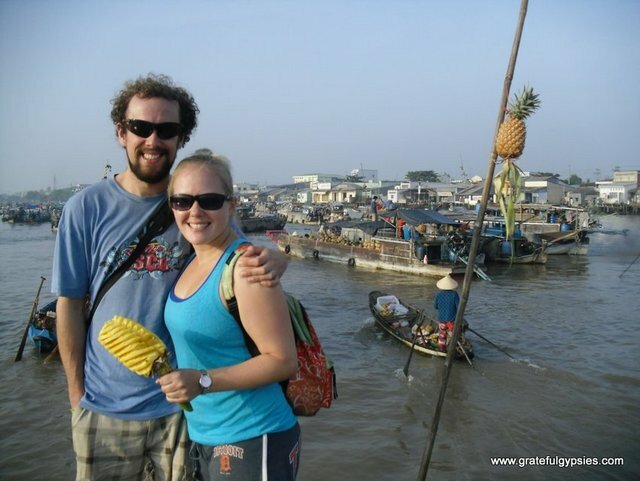 Our tour began with a visit to the Cai Rang floating market. People from all over the Mekong Delta ride here in loaded boats to sell mainly fruits and vegetables. Some require a 7-8 hour trip just to arrive. As a result, they’ll stay there for days at a time until their boat is empty, and then head back and repeat the process. GoPro shot of the floating market in action. On many of the boats, you can see a large stick with something hanging from it. This is basically an advertisement that tells you what is for sale on the boat – the boat with a pineapple hanging from it sells pineapples. All smiles with a fresh pineapple. Of course, there are also plenty of entrepreneurs who show up to sell food and drink to the vendors and tourists alike. Mr. Hung ordered up his breakfast as well as some sweet snacks for us from a lady running a small shop on her boat. A tasty treat on the boat. 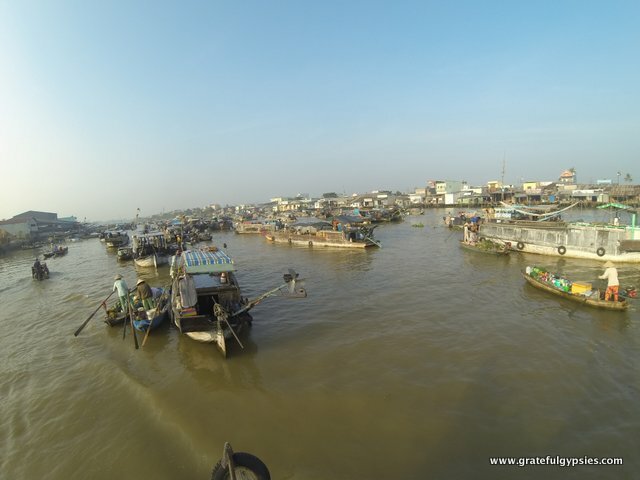 It was fascinating to see this floating market in full swing, and even better that we got an early start and were on our way out before massive groups of tourists arrived. 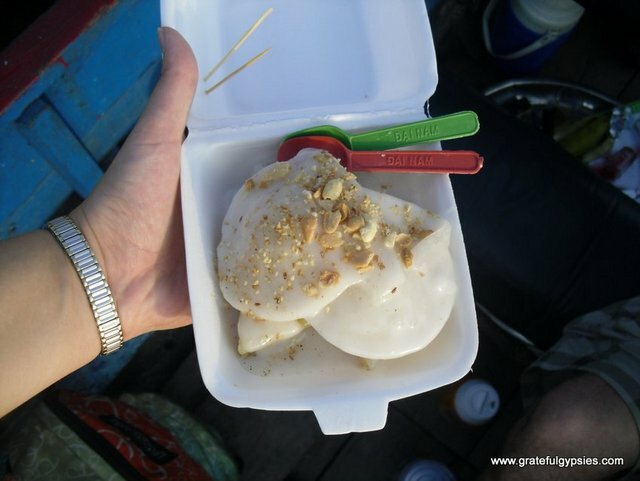 The incredible Cai Rang floating market. The rest of our tour featured stops at local farms and workshops, where we got a chance to see how people make a living on land in the Mekong Delta. 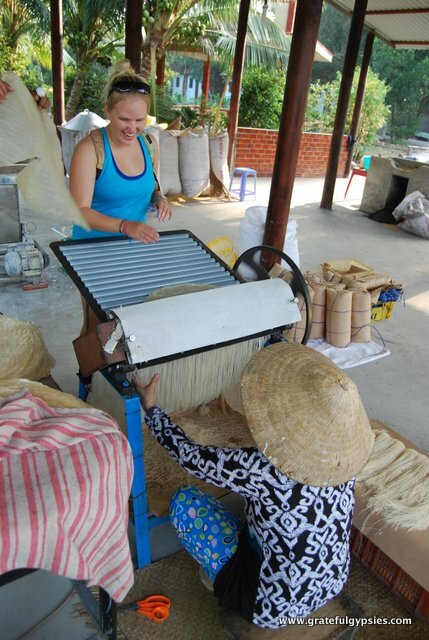 First, we visited a rice paper workshop. As we had already had some practice doing this in Hoi An, we wowed them with our skills (not really). 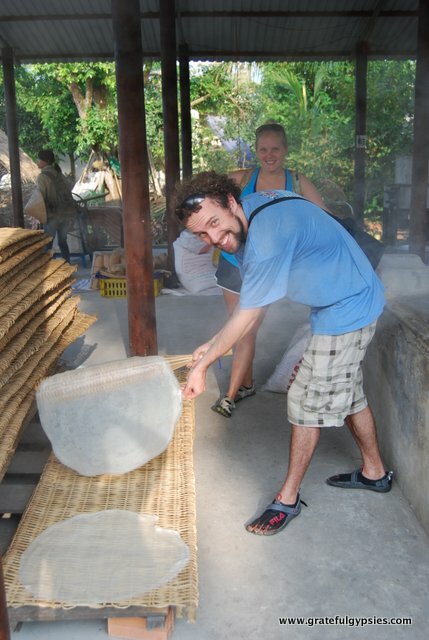 Clearly a natural at rice paper making. Having tons of fun making noodles. 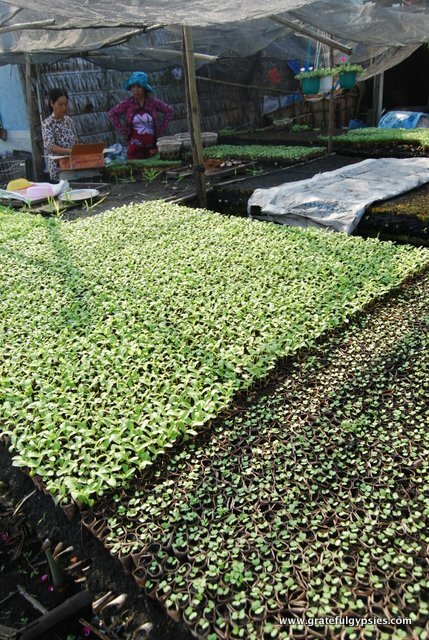 Next we dropped by a garden where the people grow all sorts of things – flowers, spices, vegetables, and more. They start the plants in motion, and then transport them to local farms when they bud. Checking out a garden in the Mekong Delta. From there we stopped by a rice/watermelon farm. Despite the fact that we’ve eaten watermelon probably hundreds of times in our lives, we had no idea how the massive fruits were grown. Turns out they come right out of the ground! 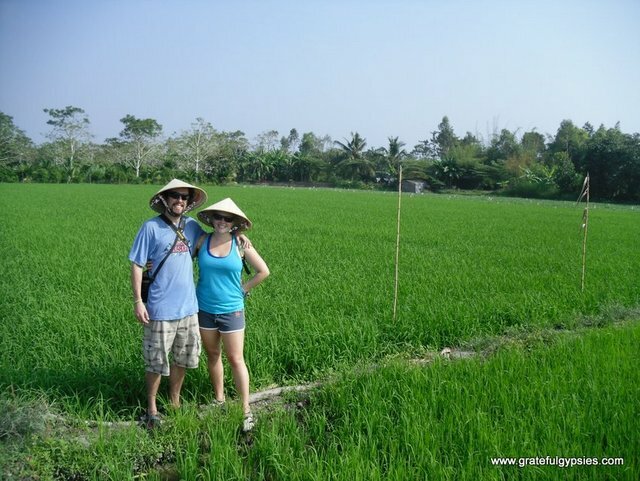 While on the farm, Mr. Hung insisted that we snap a photo of us in the traditional Vietnamese hats. He doubled as a tour guide and photographer for the whole day. We’d last about 1/2 a day as Vietnamese farmers. 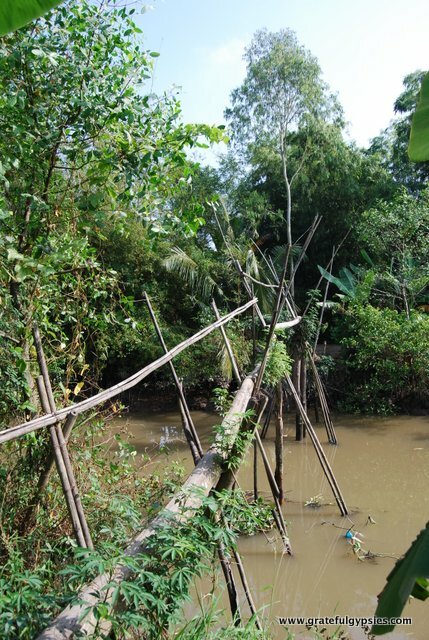 Before leaving the farm, we checked out the “monkey bridge.” In order to cross the river, locals have assembled a makeshift wooden bridge. Although we saw a few people scamper across it and make it look easy, we didn’t try for fear of falling into the murky brown water. Would you cross the monkey bridge? The last stop of the day was a rice factory, where giant machinery and diligent workers churn out huge bags of rice for sale. From the farm to the factory, Mr. Hung explained all the intricacies of how rice is made. For such a simple little thing, it sure takes a lot of work for it to get to your plate. 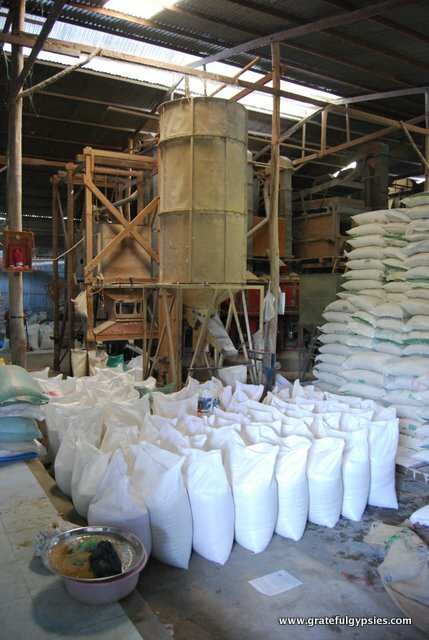 Inside of a Vietnamese rice factory. Back at the guesthouse, we took a power nap as we were drained from the long day and the hot sun. In the evening, we joined some other guests with Mr. Hung as our guide for a bike trip around the village. The highlight was a brief stop outside of a local primary school. The kids had just finished for the day, and they were playing a sort of hackey-sack/volleyball hybrid. We joined in and had tons of fun, although we were pretty terrible. Rachel ready to cruise around the town. 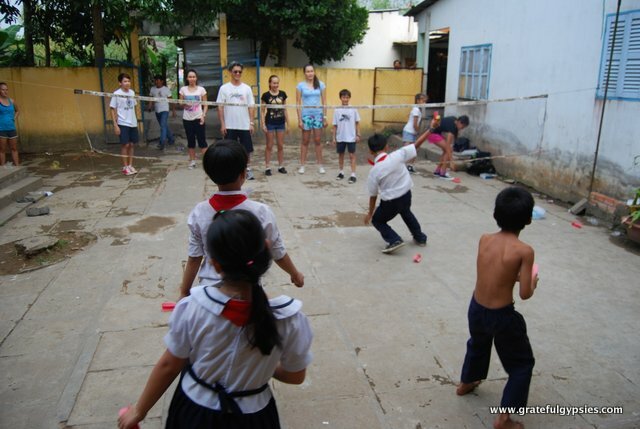 After school games with the local kids. 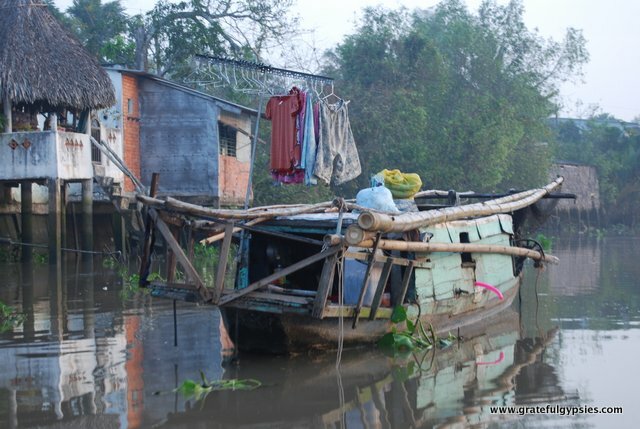 All in all, it was probably better that we skipped out on Santa Con HCMC in favor of a trip to the Mekong Delta. This area is so important to the country and is such an interesting place that it would be a shame to leave it off of any Vietnam itinerary. 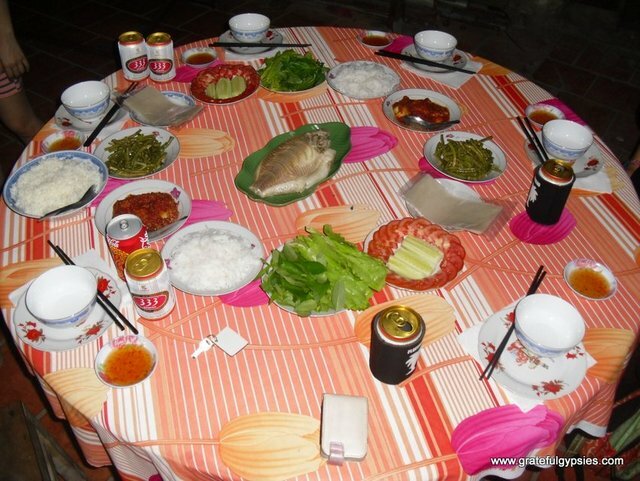 After our brief but enjoyable stay at Mr. Hung’s place, we were off to our last stop in the country – Ha Tien. Transportation: From HCMC, we took a bus to Can Tho. There are tons of buses running all day, taking around 3-4 hours and costing between $4-7. Accommodation: We stayed at Hung’s Homestay, which is actually a good 15-minute ride out of the city. He and his family are all super nice, and we can highly recommend a stay there. Although the room wasn’t anything special, the quiet location and the ease of doing a boat tour more than make up for it. Oh, and an awesome breakfast and dinner are included in the price ($30/night). Getting Around: We were picked up and delivered to the bus station by motorbikes. 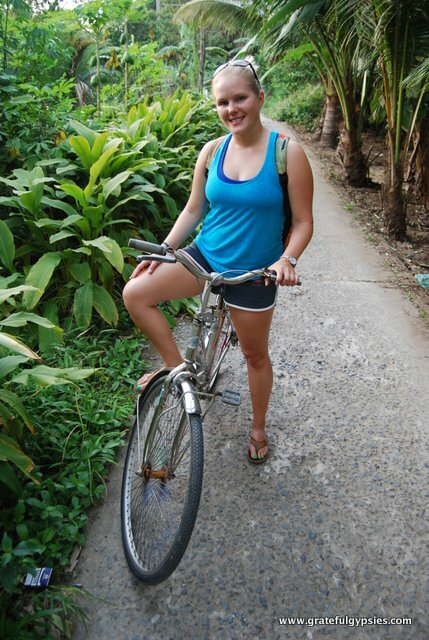 Other than that, we just took a day tour on Mr. Hung’s boat and cruised around the neighborhood on bicycles. The most important thing here is securing a boat for the day to take you around. We paid $30 for the day with Mr. Hung. 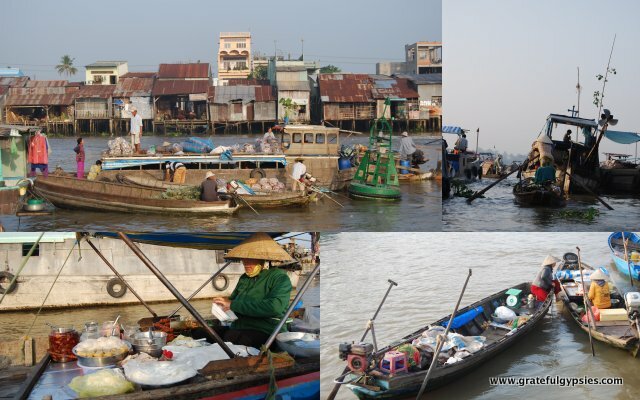 Activities: The big draw here is the Cai Rang floating market. Other than that, you might as well visit some local farms and workshops to get a feel for how people make a living in the area. Food/Drink: We didn’t need to worry about finding a good meal, as both breakfast and dinner were included with our room and were very substantial. If you stay in the city proper, there are plenty of options for food and drink. Recommended Time: The two nights we spent there seemed adequate enough, but it may be better to try and arrive a bit earlier than we did. We got in in the evening the first night and didn’t have much time before dark. It would have been nice to look around the neighborhood or even the city a bit more. Total Cost: Check back for our cost report on this one. It’s just the theme that we use for the blog… I’ve tried to mess around with it but to no avail. One of these days I’ll figure it out. The captions are probably the least important part of the posts, they’re just there to fill space around the border.